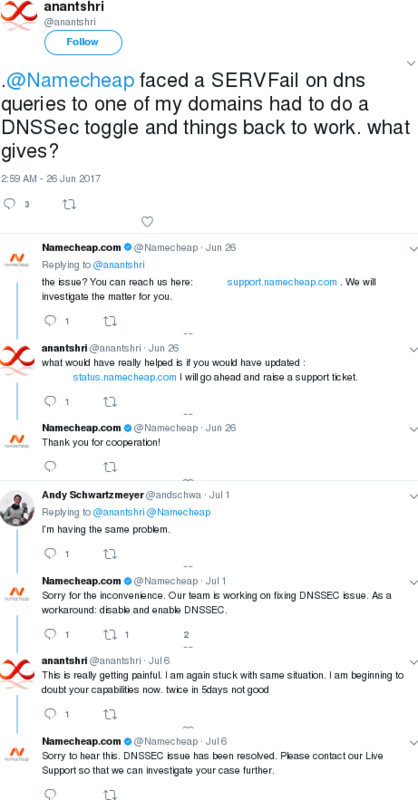 This page gives some details on the Namecheap customer DNS DNSSEC outage that began around June 22, 2017. 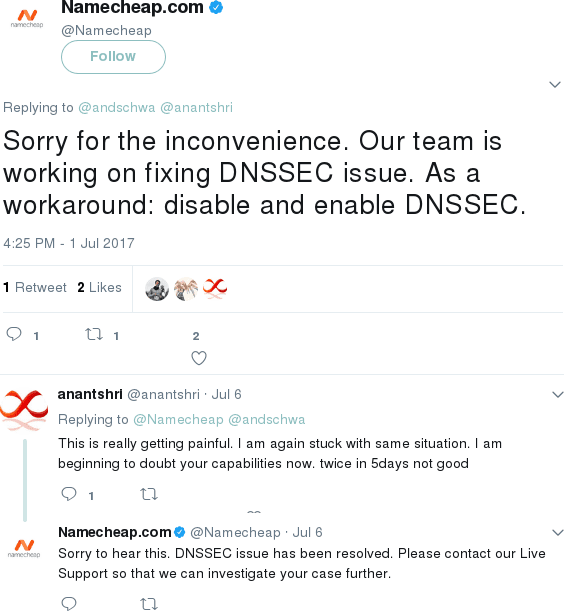 The workaround given by Namecheap was for customers to manually disable and then re-enable DNSSEC. Some users reported doing this multiple times. Hah! 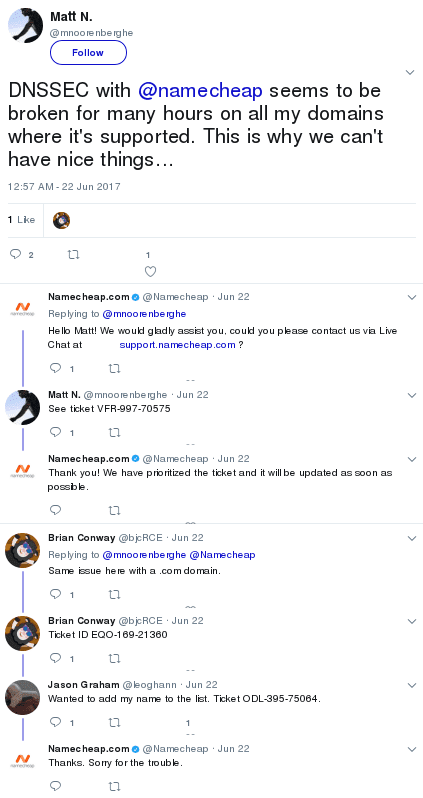 There isn't one, and Namecheap didn't even mention this outage on their status.namecheap.com website. It was only discussed on Twitter by angry customers and an apologetic customer service rep.
Below you'll find linked quotes and screenshots in case any tweets are deleted. 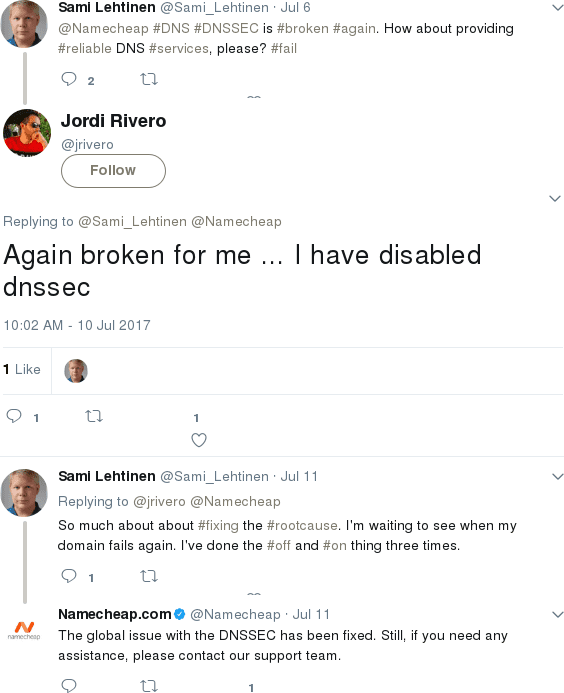 2017-06-22: @mnoorenberghe writes: "DNSSEC with @namecheap seems to be broken for many hours on all my domains where it's supported. 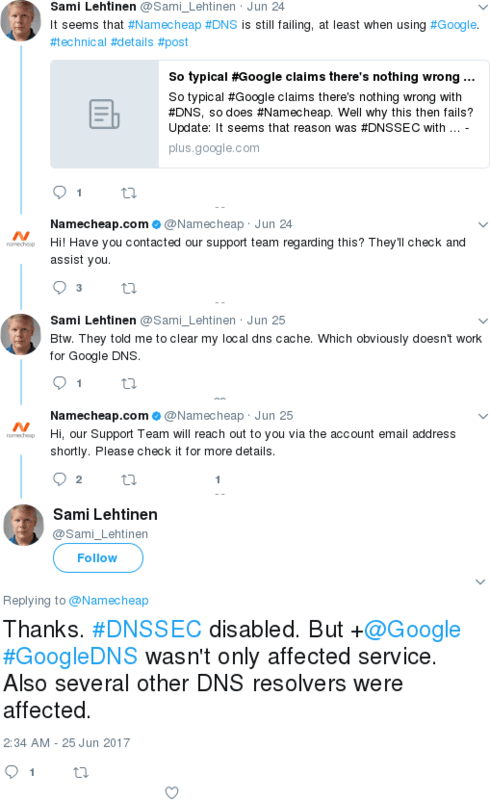 This is why we can't have nice things..."
2017-06-24: @Sami_Lehtinen writes: "It seems that #Namecheap #DNS is still failing, at least when using #Google. #technical #details #post"
2017-06-26: @anantshri writes: ". @Namecheap faced a SERVFail on dns queries to one of my domains had to do a DNSSec toggle and things back to work. what gives?" 2017-07-01: @Namecheap writes: "Sorry for the inconvenience. Our team is working on fixing DNSSEC issue. As a workaround: disable and enable DNSSEC." 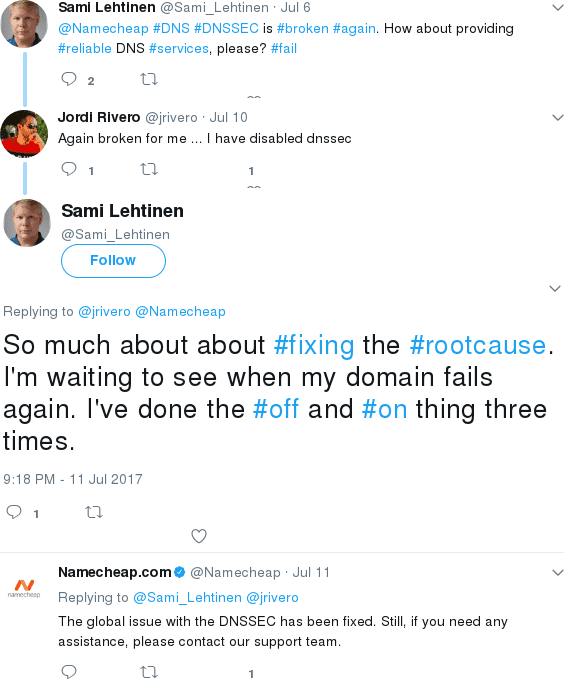 2017-07-11: @Sami_Lehtinen writes: "So much about about #fixing the #rootcause. I'm waiting to see when my domain fails again. I've done the #off and #on thing three times." 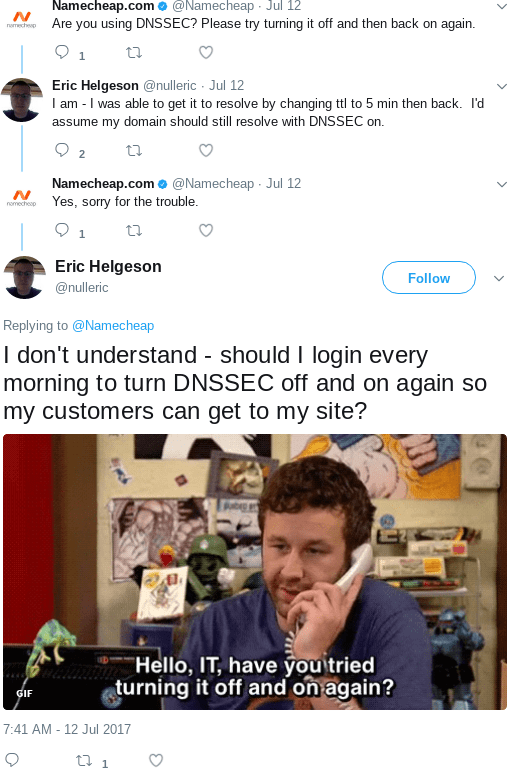 2017-07-12: @nulleric writes: "I don't understand - should I login every morning to turn DNSSEC off and on again so my customers can get to my site?" 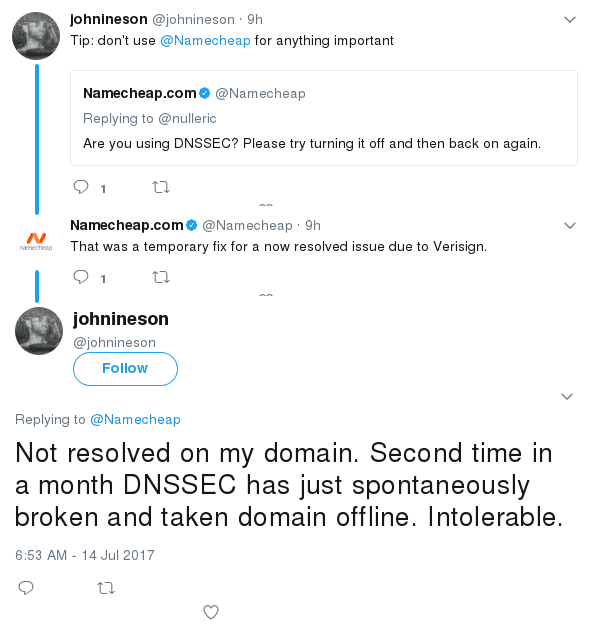 2017-07-14: @johnineson writes: "Not resolved on my domain. Second time in a month DNSSEC has just spontaneously broken and taken domain offline. Intolerable." 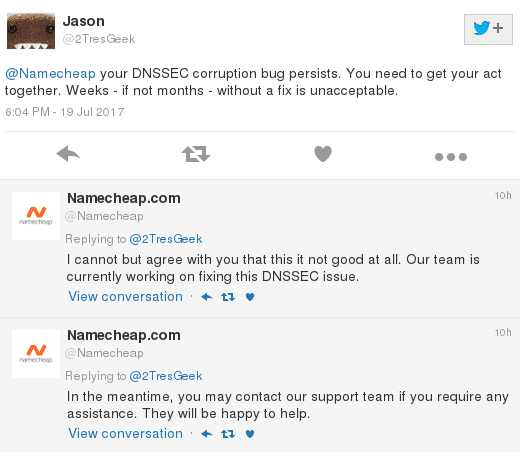 2017-07-19: @2TresGeek writes: "@Namecheap your DNSSEC corruption bug persists. You need to get your act together. Weeks - if not months - without a fix is unacceptable." 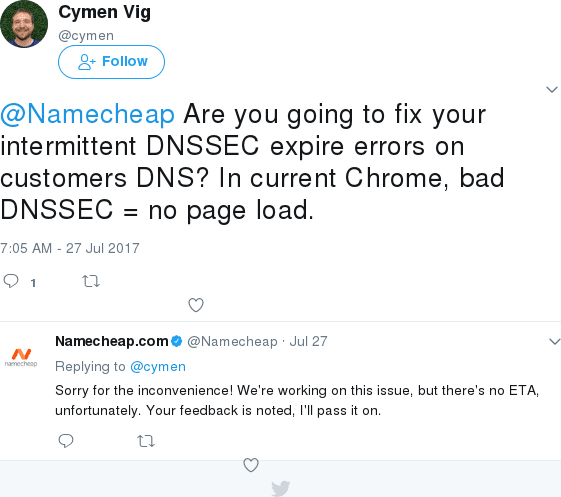 2017-07-27: @cymen writes: "@Namecheap Are you going to fix your intermittent DNSSEC expire errors on customers DNS? In current Chrome, bad DNSSEC = no page load." 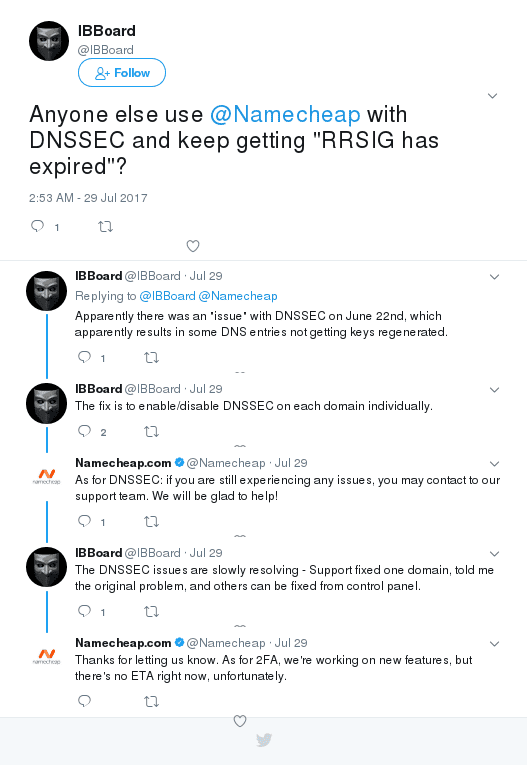 2017-07-29: @IBBoard writes: "Anyone else use @Namecheap with DNSSEC and keep getting "RRSIG has expired"?"